The Fontan operation was first performed in 1968. Since then, this operation has been performed on thousands of patients worldwide. Results vary from very good for many decades to very bad with a pleiad of complications and early death. A good understanding of the physiology is necessary to further improve results. The Fontan connection creates a critical bottleneck with obligatory upstream congestion and downstream decreased flow; these two features are the basic cause of the majority of the physiologic impairments of this circulation. The ventricle, while still the engine of the circuit, cannot compensate for the major flow restriction of the Fontan bottleneck: the suction required to compensate for the barrier effect cannot be generated, specifically not in a deprived heart. Except for some extreme situations, the heart therefore no longer controls cardiac output nor can it significantly alter the degree of systemic venous congestion. Adequate growth and development of the pulmonary arteries is extremely important as pulmonary vascular impedance will become the major determinant of Fontan outcome. Key features of the Fontan ventricle are early volume overload and overgrowth, but currently chronic preload deprivation with increasing filling pressures. A functional decline of the Fontan circuit is expected and observed as pulmonary vascular resistance and ventricular filling pressure increase with time. Treatment strategies will only be successful if they open up or bypass the critical bottleneck or act on immediate surroundings (impedance of the Fontan neoportal system, fenestration, enhanced ventricular suction). The Fontan operation was first performed in 1968.1 Since then, this operation has given hope on better outcome for thousands of patients worldwide. Each centre has a wide spectrum of clinical outcomes: our best patient is currently a medical practitioner enjoying recreational cycling in the Alps, while others may suffer from numerous complications with poor quality of life. Frequently, we cannot identify where management differed to critically alter the final result; current treatment regimens do not reliably predict a good or bad result. Hospital survival has markedly improved with a reduction in mortality to 1%–2%. In the last couple of years, despite major efforts, improvements in clinical results have been limited. Notwithstanding the most powerful and expensive current cardiovascular treatments, we can only improve some patients by 1%–8%, which is almost negligible since they require an improvement in the region of 50%–200%. To effect further improvements, a better understanding of the pathophysiology of the circuit is required, pinpointing the critical bottleneck that really determines outcome and differentiate this from less important or secondary phenomena. Improved insight will only allow better-quality treatment of the complications, but most importantly, avoid a failing Fontan. A conventional cardiologist looks at a Fontan circulation with a biased eye: in the case of a patient with venous congestion, low output and a large thick hypocontractile ventricle, it is intuitive to ascribe this to a pure or dominant ventricular problem. The Fontan circulation, however, appears to be an exception to that rule. The normal cardiovascular system consists of two circuits, pulmonary and systemic, connected in series and driven by two synchronised pumps (figure 1A). In a ‘Fontan circulation’, there is no pump to propel blood into the pulmonary arteries since the systemic veins are directly connected to the pulmonary arteries (figure 1B). The remaining postcapillary energy is harnessed to drive blood through the lungs. However, the pulmonary impedance hampers venous return through the pulmonary vascular bed leading, like any dam wall or bottleneck, to congestion upstream and restricted flow downstream (figure 2).6 ,7 The majority of the clinical and physiological ailments in a Fontan circuit are due to the upstream venous congestion and the downstream decreased output. Scheme of the normal cardiovascular circulation (A), and the Fontan circulation at different stages (B and C). (A) Normal biventricular circulation: the pulmonary circulation (P) is connected in series to the systemic circulation (S). The compliance of the right ventricle ensures that the right atrial pressure remains lower than the left atrial pressure and delivers the driving force to the blood to overcome pulmonary impedance. (B) Fontan circuit: the caval veins are directly connected to the PA; systemic venous pressures are markedly elevated. 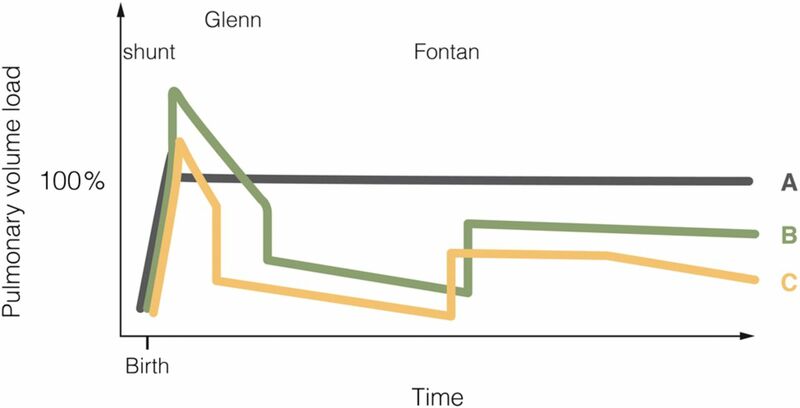 (C) Fontan circuit late (superimposed on early Fontan circuit): with time, a negative spiral ensues: pulmonary resistance increases resulting in further increase in CV congestion but even more in reduced flow, which increases ventricular filling pressure. Ao, aorta; CV, caval veins; LA, left atrium; LV, left ventricle; PA, pulmonary artery; RV, right ventricle; V, single ventricle. Line thickness reflects output, and colour reflects oxygen saturation. Steady-state flow through multiple bottlenecks in series. Hourglass with sand demonstrating multiple bottleneck concept. A circuit may consist of multiple bottlenecks (A–C). However, only the most critical obstruction (B) determines the flow of sand through the hourglass. As a result, sand accumulates proximal to the obstruction; flow can be improved by altering the critical bottleneck itself or by exerting more push just above or pull just below. The prime determinant of flow is the obstruction at bottleneck B; improving obstructions at A and C will have no effect. By constructing a Fontan circulation, a man-made neoportal system is formed since one capillary bed pools blood into another capillary bed without receiving energy from a pump. This neoportal system significantly influences output in the cardiovascular system; it thereby becomes the critical bottleneck within this circulation. Output through a bottleneck is determined by the pressure just above and just below the bottleneck and the resistance within the bottleneck (figure 2); in a Fontan circulation, this is the pressure in the systemic and the pulmonary veins, and the impedance in the neoportal system (figure 1B, C). The body tolerates only a narrow window of increased pressures in the systemic veins (up to 20 mm Hg) and a small range of ventricular filling pressures; this leaves the impedance of the neoportal system as the critical determinant of output in this newly created bottleneck. The ventricle, although providing the driving force for the circuit, cannot compensate for the major restriction in the bottleneck: it would have to ‘pull’ blood through the lungs using a degree of suction which is not physiological.8 In this situation, the ventricle is no longer controlling the cardiac output nor can it decrease the extent of congestion in the systemic veins; the role of the ventricle is reduced to pump the output allowed by the Fontan. However, the ventricle can (and will in time) deteriorate as a result of the limited flow through the bottleneck by increasing its end-diastolic pressures, which will worsen systemic venous congestion and further reduce output (figure 1C). Figure 3 illustrates the relationship between cardiac output, contractility and pulmonary vascular resistance (PVR). The noticeable influence of changes in PVR on cardiac output in patients with Fontan circulation is demonstrated and illustrates how output is primarily determined by resistance in the neoportal system in these patients. Furthermore, in patients with Fontan circulation, increases in contractility (systolic function) will not lead to increases in cardiac output at rest: inotropes may make the ventricle squeeze harder but as preload is limited it will not eject more. The impedance exerted by all the different elements making up the neoportal system is extremely important to guarantee efficient flow in the Fontan circuit. These include the surgical caval–pulmonary connections, the pulmonary arteries, the pulmonary capillary network (including the precapillary sphincters) and the pulmonary veins with their atrial connections. Impediments in any area of the neoportal system will markedly alter output of the Fontan circuit to a much greater extent than similar impairments in patients with a normal biventricular circulation. Any of pulmonary hypoplasia, stenosis, distortion, loss or exclusion of large vessels or microvessels, vasoconstriction, pulmonary vascular disease, turbulence and flow collision, collateral flow, flow mismatch or obstruction by external compression may lead to such impairment. 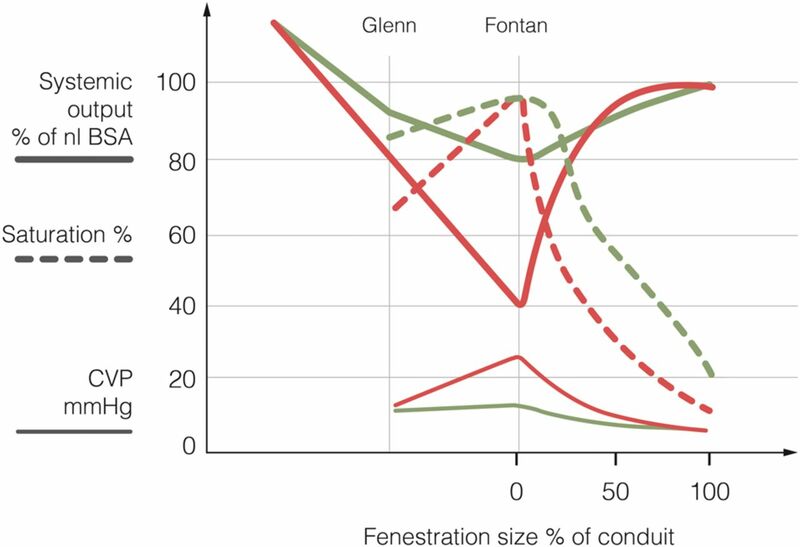 As in any bottleneck, upstream congestion and downstream limited flow can be mitigated if adequately bypassed; in a Fontan circulation, such bypass is provided by a fenestration. A Fontan fenestration will lead to improvements in cardiac output associated with a concomitant decrease in venous congestion but to the detriment of arterial saturation. Figure 4 shows the relationship between effective circulatory flow (output), venous pressures and oxygen saturations in a successful and a failing Fontan circuit as well as the effect of progressive enlargement of a fenestration acting as a bypass for the bottleneck. A successful Fontan circuit with a neoportal system with low impedance is characterised by only a mild decrease in cardiac output associated with a mild increase in systemic venous pressures; there is no need for a fenestration, thus no arterial desaturation. In a failing Fontan circuit, the high resistance of the neoportal system will result in a reduction in output and raised venous pressures to intolerable levels; a fenestration will lessen these effects, but a satisfactory compromise between desaturation on the one hand, and congestion and output on the other hand may not be reached. The importance of a bottleneck in any circuit is identified by the efficiency of a bypass; the effects of manipulation of the fenestration prove that this bottleneck is critical in the Fontan neoportal system. In other words, as long as a fenestration improves output and congestion, the neoportal system is the critical bottleneck. Limitations of the Fontan circuit become evident during exercise (figure 5). Healthy athletes can increase their pulmonary blood flow significantly during peak exercise. This is accomplished by a reduction in PVR due to vasodilation and recruitment of segments and increased right ventricular work consisting of flow acceleration coupled with increased systolic pressures up to 70 mm Hg.9 In the patient with Fontan circulation, there is no pump to increase and accelerate pulmonary blood flow. Furthermore, pulmonary vascular reactivity and recruitment of vessels are limited or even absent. A patient with Fontan circulation has therefore a restricted ability to boost cardiac output during exercise. 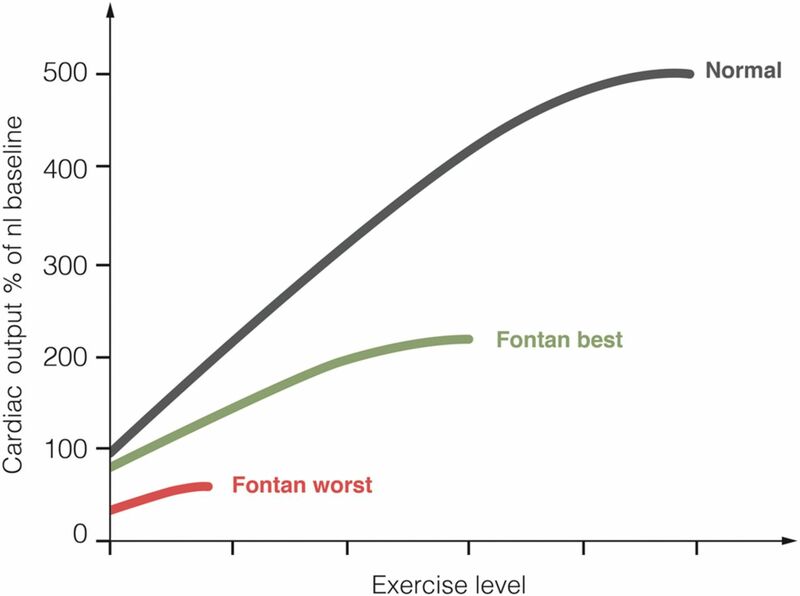 However, despite all this, clinicians are repeatedly impressed by the ability of patients with a Fontan circulation to enjoy a nearly normal life, including mild-to-moderate physical activities. More than 90% of all hospital survivors remain in New York Heart Association (NYHA) class I or II for several decades. In many patients, educational achievements are comparable with the regular population and they are able to pursue a wide range of professional careers.10 However, over the years there is an early and progressive decline of functional capacity in some subgroups. Throughout the Fontan strategy, the ventricle is exposed to very different and extreme loading conditions that can cause structural remodelling and cardiac dysfunction at many levels. During fetal life and the initial palliation, a single ventricle is volume overloaded (250%–350% of normal for body surface area (BSA) which will lead to ventricular overgrowth, eccentric hypertrophy and if excessive, will cause dilation, spherical reconfiguration and dysfunction.4 At the time of the Glenn operation, the volume load on the ventricle is reduced to about 90% for BSA, and later when completing the Fontan circuit down to 50%–80% for BSA.4 Collateral flow to the lungs may mitigate these changes. The ventricle thus evolves from volume overloaded and overstretched to overgrown and (severely) deprived. As in any clinical situation with decreased output, the reduction in preload will result in arterial vasoconstriction and increased afterload for the ventricle. It should therefore not come as a surprise that the deprived ventricle in a Fontan circuit shows both systolic and diastolic dysfunction which to a large extent are secondary phenomena.11 Also, the ventricle may now enter a vicious cycle whereby the low preload results in remodelling, reduced compliance and increasing filling pressures. This phenomenon of progressive ‘disuse hypofunction’ occurs after longstanding volume deprivation <70% of the ‘due’ preload.12 ,13 Any degree of overgrowth will amplify the degree of deprivation. Any increase in pulmonary venous atrial pressure will further decrease transpulmonary flow, resulting in a continuously declining cardiac output. Such ventricular disuse hypofunction of chronically deprived ventricles can be gradually reversed by (re)augmenting preload, as is observed in some clinical situations as following closure of a large atrial septum defect (ASD) in the elderly, after pulmonary embolectomy or lung transplantation.14–16 However, significantly re-augmenting preload of the Fontan ventricle is rarely possible and then only in few selected patients. The Fontan ventricle may thus exhibit various features: a large spherical ventricular cavity, a hypertrophied wall, systolic and diastolic functional impairment with rising filling pressures, unresponsive to traditional treatment regimens. The ventricle in the Fontan circuit is not the critical bottleneck, but the diastolic suction does influence flow through the critical bottleneck; in time the declining ventricular diastolic function evolves from a minor to a major contributor of the failing circulation (figure 1C). Breaking out of this downward and negative spiral is very difficult to nearly impossible, with only few exceptions. Growth and development of the pulmonary vasculature are invariably abnormal in patients with single-ventricle congenital cardiac malformations. Reduced pulmonary flow may originate in fetal life and always following palliation with partial (Glenn) and total cavo-pulmonary connection (figure 6). 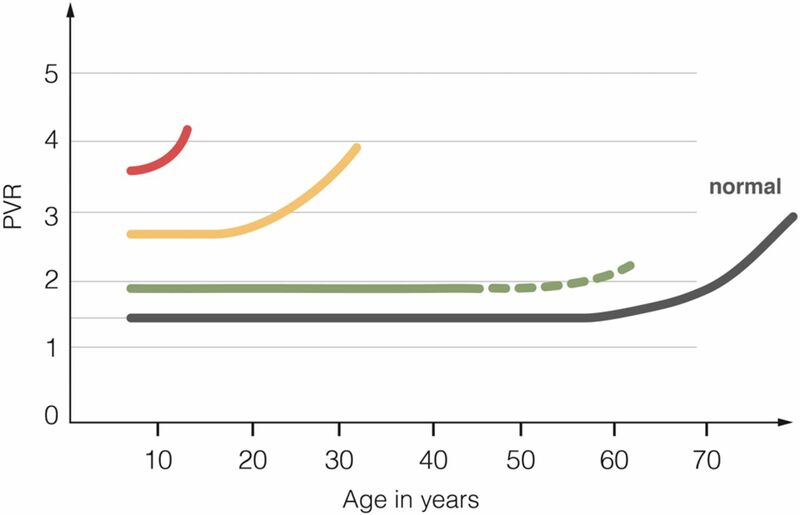 The only period where potential for pulmonary catch-up growth can occur is during the initial palliative phase before a Glenn shunt. However, initial systemic-to-pulmonary artery shunt procedure(s) may lead to maldistributed overflow or underflow causing patchy pulmonary hypoplasia or varying degrees of vascular disease. Pulmonary architecture may be further compromised by mechanical obstruction following abnormal connections, ductal constriction, surgical scarring or external compression. The Glenn and Fontan connections themselves generate abnormal environments for the pulmonary vascular bed: longstanding diminished flow, desaturation, increased collateral flow, substandard mixing of inferior and superior caval flows, lack of pulsatile flow, endothelial dysfunction and absence of periods of high flow and high pressure with vessel recruitment as normally occur during exercise. These conditions can further influence growth and function with increasing resistances. Allowing for growth and development of the pulmonary arteries especially during infancy prior to the Glenn shunt is therefore crucial; the initial palliative procedure (banding or shunt) is probably the most important intervention and determinant of future good Fontan haemodynamics. Current stratagems for functionally single ventricles frequently allow only a very limited period of controlled pulmonary ‘overflow’ and catch-up growth. Emphasis is placed on (over)protecting the ventricle by using small shunts to avoid a volume-overloaded ventricle. However, PVR is determined by a well-developed pulmonary vascular bed and if flow to the lungs is limited both in volume and time, insufficient development of the vasculature will result with high PVR ultimately leading to a poorly functioning Fontan circuit (figure 6).17 Early overprotection of the ventricle may over time lead to progressive and late severe diastolic dysfunction with increased filling pressures in the Fontan circuit because of chronic underfilling and resultant remodelling. The chronic low flow conditions will result in generalised pulmonary (and also systemic) vasoconstriction, which will lead to failure of the whole circuit (figure 7). A failing Fontan circuit is thus characterised by high and increasing PVR, which may be reversed to some extent with medication, transplantation (increased output together with pulsatile flow)18 and possibly with exercise. In a complex circuit, many components can act as a bottleneck and may be improved. However, when multiple bottlenecks are put in series, only changes at and immediately around the critical bottleneck will improve overall flow (figure 2). As demonstrated, the critical bottleneck in a Fontan circuit is the neoportal Fontan system. Treatment strategies will therefore only be successful if they open up the bottleneck (impedance of the Fontan neoportal system), bypass the bottleneck (fenestration), increase the pressure before the bottleneck (systemic venous pressure) or enhance run-off after the bottleneck (ventricular suction). Strategies aiming at factors that do not directly influence the critical bottleneck such as contractility or afterload are highly unlikely to provide satisfactory results. Elevation of pressure in the systemic veins by the muscular pump may temporarily increase cardiac output during exercise with pressures that may increase up to 30 mm Hg.19 However, chronic high venous pressures in excess of 18–20 mm Hg are poorly tolerated in patients with Fontan circulation and result in symptoms such as congestion, oedema, ascites, lymphatic failure and progressive veno-venous collaterals with cyanosis. Diuretics control some of these, but at the risk of aggravating the chronic effects of the pre-existing ventricular underfilling. Since the 1990s, surgical connections have significantly improved to the extent that little gain in efficiency is to be expected from surgical modifications.20 ,21 Older style Fontan connections, for example valved pathways and atrio-ventricular pulmonary connections, should be considered for conversion to cavo-pulmonary connection when the patient becomes symptomatic, or even earlier.22 ,23 Furthermore, even in patients who are ‘doing well’, the physician should take care to ensure that focal areas of stenosis, hypoplasia, distortion or excessive collateral flow are detected early and managed. Manipulation of the pulmonary vascular bed has emerged as a logical target in recent years. In a Fontan circuit, PVR is mildly elevated at baseline but does not decrease normally during increased cardiac output. Several agents have been studied (oxygen at altitude, sildenafil, bosentan, inhaled iloprost); however, as only few pulmonary vascular lesions are amenable to dilation, the haemodynamic improvements have been modest with a modification of PVR in the region of 0%–8%.25–28 Further studies are required to determine to what extent these agents can affect the long-term outcomes. The effects on ventricular filling pressure by agents which alter contractility, heart rate or afterload are frequently negligible: making the Fontan ventricle contract harder, faster or against a lower afterload will not increase output as the ventricle has no preload reserve. Moreover, these manoeuvres will not lower filling pressure and therefore not influence the critical bottleneck! Creation of a fenestration has proven that cardiac output can be improved and congestion relieved in these patients (figure 4).30 Closing the fenestration typically results in improved oxygen saturations both at rest and during exercise resulting in improved exercise ability. The discussion is still open whether the increased exercise tolerance outweighs the long-term benefit of decreased congestion, which might delay late hepatic and lymphatic dysfunction. Secondary creation of a fenestration late in a failing but ‘pink’ Fontan results in a degree of cyanosis that is typically not well tolerated. In such a patient, achieving a good balance between cyanosis, decreased congestion and increased output is quite difficult to impossible. Nevertheless, percutaneous fenestration in the failing Fontan may have an indication to avoid muscle and body waisting while waiting for cardiac transplant. The long-term outcomes of the Fontan operation performed in patients with a low-risk profile show good overall results: arterial hypoxaemia is eliminated, volume overload to the ventricle is abolished, the burden of chronic systemic venous hypertension is usually acceptable and most patients enjoy a reasonable quality of life for several decades. A functional decline over time is inevitable as PVRs and ventricular filling pressures increase. The Fontan palliation is characterised by creation of a pulmonary neoportal system, which becomes the new critical bottleneck that leads to upstream systemic venous congestion and downstream chronic low output. Careful attention to pulmonary blood flow and pulmonary arterial growth during the initial stages of palliation is absolutely crucial, as PVR will become the major determinant for a good long-term result. Avoiding volume overload of the systemic ventricle during initial palliation is important, but excessive emphasis on this aspect may result in a hypoplastic pulmonary vascular bed with ultimately poor Fontan physiology. The mechanical aspects of surgery and ventricular protection have been optimised and little improvement can be expected in the future, excepted for mechanical pumps. Therapeutic options for circulatory failure in a Fontan circuit are limited and unsatisfactory. Pulmonary vasculature is little amenable to vasodilation, and current therapies not as effective as expected. Some, though little, benefit may be gained if good lusitropic drugs are developed. Prevention of dysfunction by ensuring a low resistance adequate pulmonary vascular bed is therefore of utmost importance.
. Late functional status of survivors of the Fontan procedure performed during the 1970s. Circulation 1992;86(Suppl 5):II106–9.
. Abolishment of chronic volume overload. 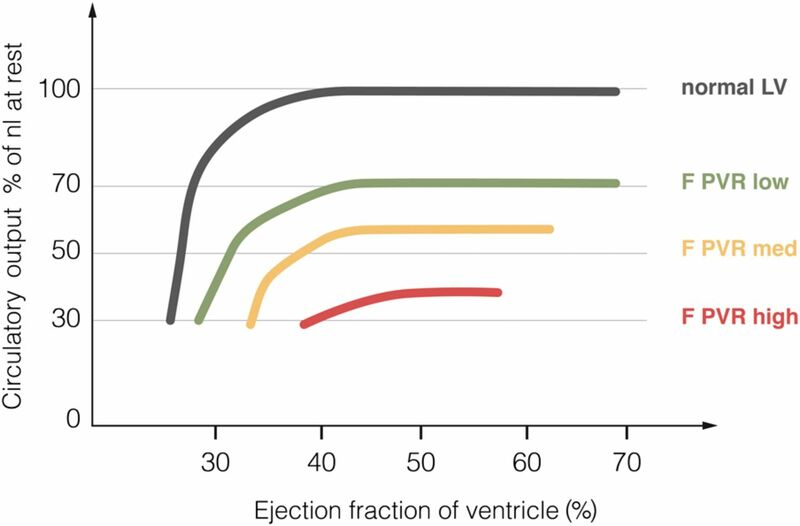 Implications for diastolic function of the systemic ventricle immediately after Fontan repair. Circulation 1992;86:II93–9.
. Left ventricular failure after surgery to correct right ventricular pressure overload in pulmonary hypertension patients. J Thorac Cardiovasc Surg 2016 (in press).
. Total cavopulmonary connection: a logical alternative to atriopulmonary connection for complex Fontan operations. Experimental studies and early clinical experience. J Thorac Cardiovasc Surg 1988;96:682–95. Contributors MG and SCB have over the last years contributed to the concepts and schematic representations.